Exhibition of contemporary art jewelry February 16 – March 30, 2019. Opening reception February 16, 4:00 – 7:00 pm. To open the 2019 season of exhibitions, gallery LA Joaillerie par Mazlo, the Arketip Association and the Robert Mazlo Endowment Fund for Art and Contemporary Art Jewellery will host Gioielli in Fermento, a collective exhibition of art jewelry orchestrated by Italian curator Eliana Negroni and inspired by the Mediterranean wine, culture and lifestyle. 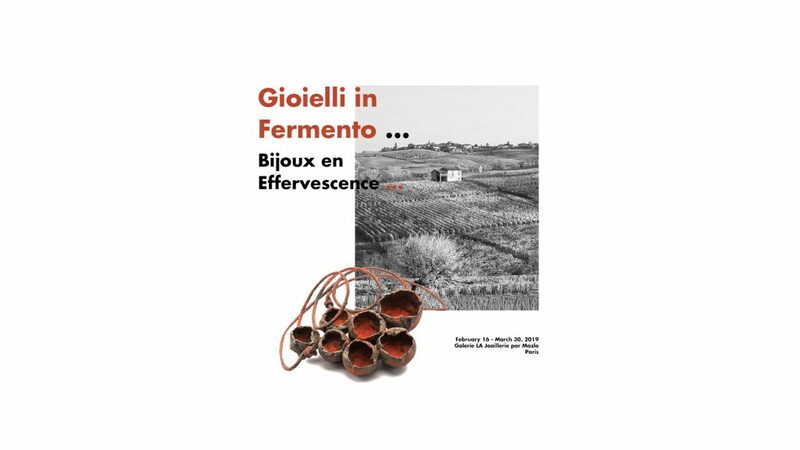 Gioielli in Fermento – Fermenting Jewelry – is an international competition dedicated to contemporary jewelry and organized since 2011 in Italy in historical places of Val Tidone, such as Villa Braghieri Albesani, in Castel San Giovanni, Piacenza. This project’s inspiration is rooted in wine culture and especially in an analogy between the process of wine fermentation and artistic creation. Like wine, which, with its diversity of tastes, terroirs and values, is the result of the transformation of a noble and living material derived from nature – grapes – creation in contemporary jewelry expresses through the transformation of materials of a great variety to give birth to wearable artworks. Gioielli in Fermento thus builds bridges for the first time between two worlds. Winemakers and jewelry artists find themselves on a common playground which is the field of creativity. All of them have to negotiate with the physical and chemical characteristics of matter, in order to reveal its intrinsic qualities while making it the support of a personal and singular expression. The result is a great wine or a jewelry artwork, able to transcend time. Located in the heart of Saint Germain des Prés, LA Joaillerie par MAZLO was founded in September 2010 by author jeweller Robert Mazlo, with the ambition to promote the various forms of expression of contemporary author jewelry. The thematic collective exhibitions aim to associate artists from different disciplines, thus encouraging a transversal and humanist dialogue between artistic mediums, beyond traditional boundaries. Its principal areas of interest focus on artists working with a narrative and/or figurative approach, challenging their medium and know-how, and most of all, fueling their works with deep poetic or philosophical meanings. Subway : Pont Neuf, line 7. Subway : Saint-Michel, Mabillon or Odéon, line 4 or 10. Tuesday – Friday 2:00 – 7:00 pm. Saturday 11:00 am – 1:00 pm and 2:00-7:00 pm.